The subject of bedpans and urinals may be an uncomfortable one to discuss, however, it’s a necessary one. More than 800,000 seniors are hospitalized and about 300,000 get a hip fracture as the result of a fall. Our review will show you the full range of products available. Bariatric bedpans have a tapered front that slides easily under patients. Extra large bedpans can also be used as a female bariatric urinal. Bed Pans are 15'' long x 12.15 wide. Features a non stick surface that is easy to clean with standard household cleaners. 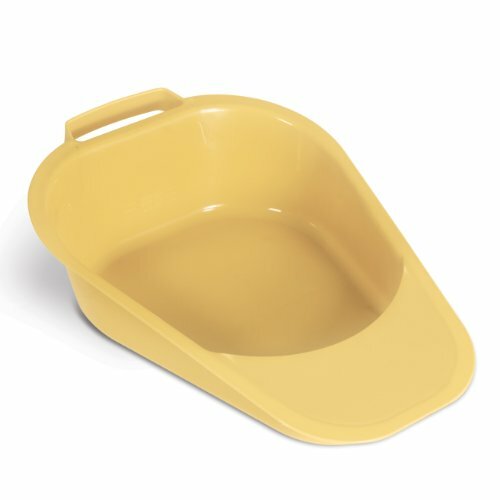 The Vakly Extra Large Contour Bariatric Bedpan is ideal for seniors who live at home with the help of a caregiver. Its large profile and contoured shape make it easy for both men and women to use. It’s also practical for the caregiver since it it is easy to move into place. It has a wide rim around the perimeter, making it adequate for heavier individuals. It is easier for the caregiver to use. The Medpro Fracture Bed Pan with Plastic Guard and Built-In Handles is another product that considers both seniors and their caregivers with added features that make it easy to use for both. Like the previous one, it is tapered to make it more comfortable. The handle and splash guard make it easier to position and help maintain a cleaner environment. It is ideal for individuals with limited to no mobility as it requires little physical effort to position and remove. It is cost-effective and less bulky than comparable products. While it is comfortable, some may find that it’s too small. It is most appropriate for larger individuals. Resistant to stains & cracks. The Conva Tec Stainless Steel Bed Pan is a well-designed and constructed product, ideal for seniors with limited mobility. It is also tapered at 4 inches at the back and 2.5 inches in the front. It holds up to regular use and cleaning. It is sturdier than comparable products because it’s made of stainless steel. The size will suit most individuals, though it may be too big for smaller individuals. That said, it is appropriate for use with heavier people because of the materials and construction. The only other drawback we found was the price which is costly compared to other ones on the market. It is a sturdy product that will handle a lot of use. 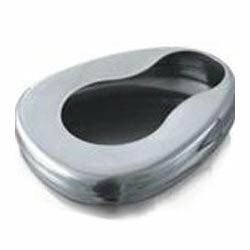 Hospital quality bedpan, Can use at home. Durable,Strong,PP material.Smooth contoured comfortable edges. Stable,Weight capacity certified up to 100kg/220lbs. 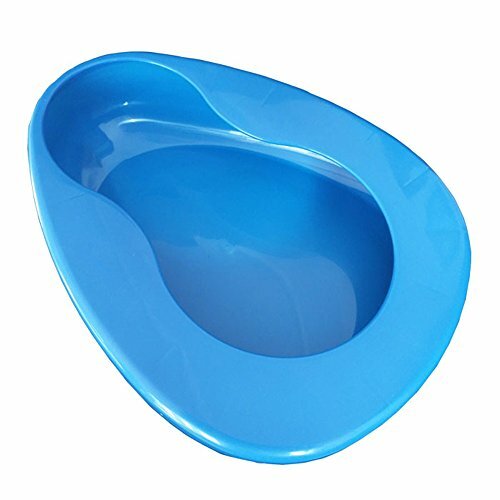 The YUMSUM Firm Thick Stable PP Bedpan is made of polypropene which strikes an excellent balance between durability and ease of use. The contoured shape and rounded edges make it a comfortable choice for seniors who require it for daily use. It is ideal for individuals who weigh up to 220 pounds. The solid plastic is thick and holds up to regular use. It is sturdier than other plastic products we’ve reviewed, making it an excellent value for the price. It’s easy to clean for everyday use and stands up to sterilization. The low profile makes it easier for heavier people to use. The AliMed Bariatric Bed Pan is a stark departure from the designs you may typically see in bedpans. It is almost triangular with a larger rim along the back of the product. The sleek, low profile make it ideal for seniors to use alone or with the aid of a caregiver because it is easy to manipulate and position. It can handle weights up to 1,200 pounds, making it a durable and sturdy product for most uses. It slopes down from 3 inches to 0.5 inches making it ideal for heavier individuals. The product works well and is comfortable. It’s a decent size, albeit, a bit shallow. The best thing about it is that seniors with varying degrees of mobility can use it without assistance. It’s a comfortable, albeit, temporary alternative. Smooth and easy to clean.The airtight is closed and can be plugged into the air cushion. The KIKIGOAL Washable Portable Air Inflation Blue Bed Pan provides a more comfortable alternative to standard bedpans at an affordable price, which includes the hand pump too. It Is ideal for seniors who may require a bed pan for occasional use as a result of incontinence issues or times of limited mobility. The PVC material is soft and durable. It’s essential not to overinflate it so that it stays flexible. 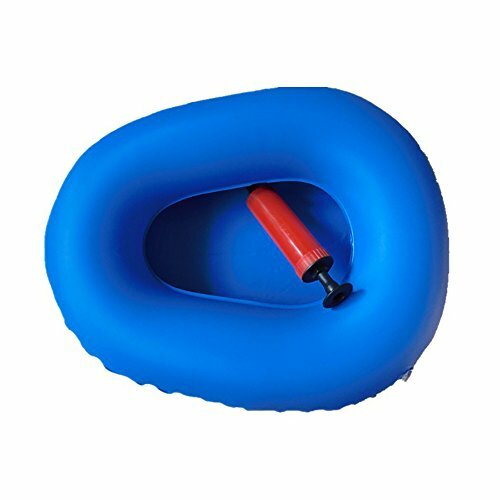 The manufacturer recommends leaving it inflated and using it for no more than 15 minutes at a time. Other than the comfort, the primary function of this product is best as a temporary replacement for a regular bedpan. It’s not as easy to clean as the others which can affect its use. The ergonomic design adds to its comfort. 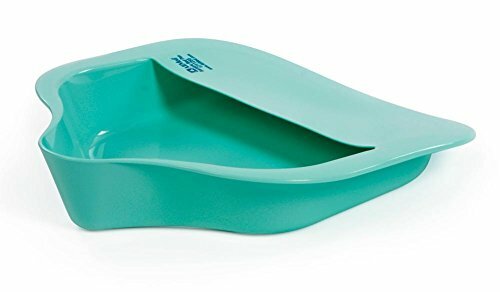 The Healthstar Pontoon Bedpan is the most affordable of all the products we’ve reviewed. It has an ergonomic shape which makes it comfortable for seniors who may be bedridden or require a bedpan for daily use. It is made from sturdy polypropylene, making it ideal for long-term use. The quality is decent despite the low price. It has a wider profile that tapers to the front of the item. It’s appropriate for use by both men and women. It’s worth noting that the back is a thinner strip of plastic than you may typically see in these products. It offers a discreet alternative for bedridden men. 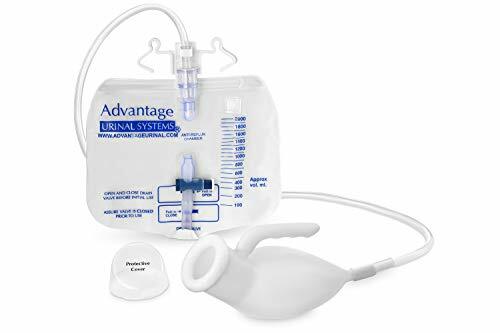 The Advantage Urinal Systems Reusable Portable Male Comfort Fit provides a more discreet product for men instead of using a standard bedpan. It is ideal for seniors who live at home and want to maintain independence and privacy, providing men with a safe alternative to repeated trips to the bathroom. It comes as a complete system with everything that you’ll need. It has a one-way valve to reduce spills. The accompanying bag has a decent capacity so that you needn’t get up in the middle of the night. That can, in turn, reduce falls. That benefits both the patient and the caregiver. If you get dizzy when you stand up, you’re more likely to have an accident. It also saves time for your provider. Overall, it’s an excellent alternative to a regular bedpan. We’ll discuss each one in detail with some insights about choosing the right product for you. The design is straightforward and resembles a toilet. There are, however, a few significant differences. One concerns the shape. Most products have a tapered form to make it easier to place and remove, which is essential for seniors who require the help of a caregiver when using the product This aspect plays a significant role in satisfaction. It has to toe a fine line between ease of use and comfort. Another consideration is the overall size. That involves the physical dimensions as well as the weight capacity of the product. For heavier individuals, you’ll find items that are labeled bariatric usually with some figure indicating a certified number of pounds. That condition goes the other way too. A bedpan that is too large for the user is equally unpleasant to use. Bariatric bedpans include features like a wider rim, larger size, and sturdier construction to accommodate the needs of a heavier individual. However, the practical considerations that we discuss below still apply. Most products are useful for both men and women. However, you will find products like the portable urinal that serve male patients exclusively. It’s an excellent way to afford them some discretion and to prevent trips to the bathroom at night, which increase the risk of falls for seniors. They also offer alternative uses, such as travel, which adds to their value. These products are most commonly made of PP, PCV, and stainless steel, which. are all relatively easy to clean. The difference often boils down to price. While stainless steel is more durable, it is also more expensive, which is not a major concern since bedpans don’t cost a lot in general. We consider comfort and usability as the main considerations when choosing one over the other. In any case, careful inspection of the bedpan between uses is imperative. For plastic products, look for ones that have non-stick surfaces to avoid stains. Likewise, stick with rust-resistant ones if you choose an item made from stainless steel. If you find any imperfections, discard it and replace it with another one. Many bedpans have an ergonomic design which goes a long way to making them more comfortable, especially for seniors who require them for daily use. You’ll see these elements with larger rims, contours, and perhaps, most importantly, rounded edges. It’s essential to remember that a bedridden individual is at a higher risk of getting ulcers or bedsores from laying in the same position for long periods of time. It also raises the chances of an infection. 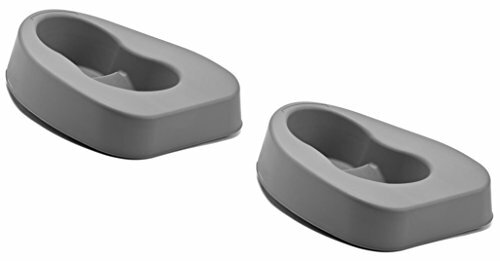 An uncomfortable bedpan with sharp points can exacerbate the issue and ultimately affect the patient’s quality of life. For seniors aging in place, it is essential to find a product that increases their quality of life, making it safer and more enjoyable for them to live independently. Therefore, we strongly urge you to get feedback from the individual and get a new one if the existing one isn’t working out well for them. There are numerous products on the market, many designed to address specific issues. We would be remiss if we did not mention the usage of a product from the caregiver’s point-of-view. That concerns placement and removal as well as ease of cleaning the bedpan. That aspect makes one with a handle more practical as long as it’s sturdy enough for the weight capacity. Household cleaners are appropriate for everyday use with these items. For more intense cleaning, the bedpan must be autoclavable to kill all bacteria and pathogens. That’s in the best interest of everyone involved and a worthy consideration when choosing a product. In any case, it’s essential to have a frank discussion about these kinds of products. After all, nearly 70 percent of individuals over the age of 65 will develop some type of disability that will limit their mobility and independence, making items like bedpans a fact of life. 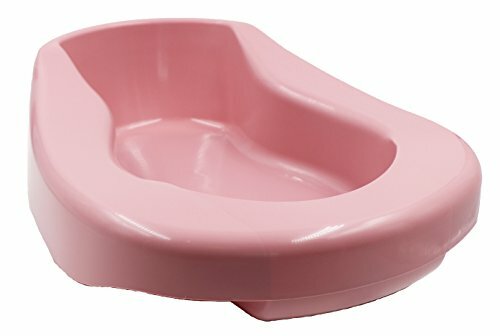 The best bedpans and urinals provide a comfortable and useful way to take care of the sanitary needs of the senior while making the task less unpleasant for the caregiver. Luckily, there are plenty of products to accommodate a wide range of uses and budgets. It’s an easy way to make sure that you or your loved one has the best quality of life possible while aging in place.